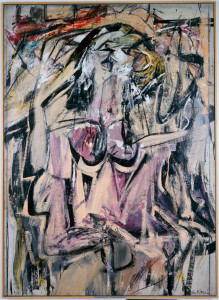 The jewel in the crown of the Weatherspoon’s permanent collection, Willem de Kooning’s painting, Woman, is both a key piece in the artist’s career and a prime example of Abstract Expressionism, the style that critically reigned in the mid-1940s and early 1950s. Yet, AbEx, as it was called, was hardly the only style of art being made and exhibited. Artists were also pursuing careers with work that was representational, surrealist, and geometrically abstract. Comprised of other collection works from the decade surrounding Woman—1945 to 1955, this exhibition features artists such as Fairfield Porter, Arshile Gorky, Hans Hofmann, Elaine de Kooning, Jimmy Ernst, Jay DeFeo, Dorothy Dehner and others. The exhibition is organized by Nancy Doll, Director of the Weatherspoon. A Weatherspoon Art Museum 75th Anniversary Signature exhibition. This entry was posted in UNCG, Weatherspoon Art Museum and tagged Nancy Doll, Weatherspoon Art Museum, Willem de Kooning. Bookmark the permalink.